On this week's news update: robot arms have the soft touch, giraffes look like their mums, and the concrete that’s bendable. And the concrete that’s bendable. Human hands can perform all kinds of delicate movements. However, robotic submarine arms, used in underwater research, struggle with small, accurate gestures. That makes it difficult to handle plants and animals gently. Now scientists at the Wyss Institute at Harvard University have developed a soft and flexible robot arm. Its movements are controlled by a researcher wearing a special glove. These new robot arms mean that in the future, it will be easier to carry out research without damaging marine life. Next up, we all know what giraffes look like. But we don’t know much about why they look like that. Now, thanks to new research from Penn State University in the US, we understand that calves inherit the pattern of their spots from their mothers. The researchers studied Masai giraffes in Tanzania, Africa, and found that not only did the calves have the same shape of spots as their mothers, but the spots also had a similar degree of smoothness to their edges. The researchers also discovered that calves with larger, more irregular-shaped spots were less likely to be killed by predators. This could mean that irregular spots provide better camouflage. And finally, concrete is everywhere. It’s the most commonly used human-made material in the world. It’s very strong, but also brittle – it can’t bend very much before breaking. This means pavements and roads need to be repaired again and again. But scientists around the world have been working on a solution, inspired by a shellfish called an abalone! The shiny material inside abalone shells is made up of tiny blocks, held together with a soft substance that makes the material strong and flexible. Concrete is normally just a mixture of gravel and sand held together with cement. But when scientists added lots of tiny stretchy fibres, it was able to bend without breaking. It was also able to self-repair! This means it could be useful not only for road repairs, but could help protect buildings from the effects of natural disasters. That’s all for this week – we’ll see you next time! A soft, flexible robot arm has been developed by scientists to help them research and handle sealife more carefully. 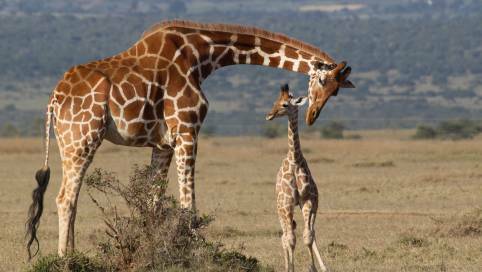 New research into giraffe coat patterns suggests that calves inherit their spots from their mothers, and that some patterns may make it easier to hide from predators. Although concrete is traditionally a hard, rigid material, scientists have developed a bendable concrete that is flexible as well as strong. Why have submarine arms used in underwater research up until now been problematic? How are the new submarine arms controlled? Can you think of anything else that this soft robotic hand could be useful for handling? Why do you think the more irregular-shaped spots provide better camouflage for the giraffes than the spots with the smooth edges? Camouflage helps prey animals like giraffes hide from predators. Can you think of any predators with camouflage? Why might they need camouflage? Can you think of any features that you have inherited from your parents? Dimples, ear shape, or perhaps hair colour? Why do you think flexible material might provide more protection during an earthquake than non-flexible material? The abalone inspired the engineers to create the flexible concrete. Can you think of an animal that might inspire you to create your own invention? The new, flexible concrete self-repairs. Does this make the concrete a living thing? Why or why not?